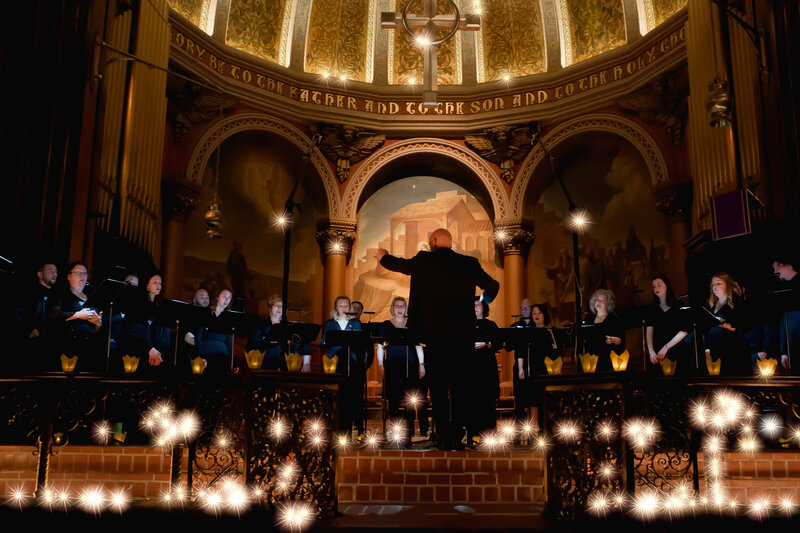 The Crossing @ Christmas at the Church of the Holy Trinity in Philadelphia began with a surreptitious ringing of Orff marimbas (by Colin Dill and Joanna Gates) and a large marimba (by Daniel Schwartz), so quiet it could have been mistaken for a low hum. The choir members processed through the center and side aisles. The first bore a candle and the others branches of pine. As the singers laid down their greens, they took their place at their music stands. Improvisations on the marimbas provided pitches and interludes between pieces. Judith Weir’s setting of the poem “Vertue” by George Herbert (1593-1633) was stark and moving. The four-verse ode to the cycles of life ended each verse with anaphorae: “For thou will die”, “and thou must die”, “and all must die” – brightening at the end with “then chiefly lives”. This theme was reflected throughout the concert. Conductor Donald Nally is devoted to words, poetry, and his message. At times it feels as if one is being schooled with words like palimpsest or chokecherries, but the music is so masterfully performed. The choir easily negotiates wild pitches, leaps, discordant intervals, often holding long sustained notes in one part as the other parts shift harmonies. The words projected in white letters above the nativity scene with its sky blue background behind the altar of the church appeared like an annunciated message in the sky above Bethlehem. The first four sections of Gavin Bryars’ setting of Wendell Berry’s “A native hill”, an essay by the award-winning poet turned farmer about our duty to care for the earth were premiered, the rest being programmed for the spring of 2019. Bryars set reams of words to music – making it almost a long recitativo. Bryars’ low bass parts mirroring the words “underlying this country, nine hundred feet below the highest ridgetops, more than four hundred feet below the surface of the river, is sea level” was performed beautifully – the rich sounds of the bass section underlying the superb solos by tenors Daniel Taylor and Steven Bradshaw. The setting by Judith Weir of e.e. cummings’ poem, “I thank You God for most this amazing day” gave musical meaning to the nonsensical words by the mischievous poet, and maintains the theme of life after death. This was the gem of the concert: the startlingly pure soprano solo by Rebecca Siler, the duet by Gabrielle Barkidjija and Julie Bishop, and the supremely quiet harmony from the supporting chorus which Mr. Nally guided securely through flowing polyrhythms. Edie Hill’s setting of Joan Wolf Prefontaine’s optimistic “Poem for 2084” where she foresees a world magically healed of lead poisoning, contamination, and hate featured a lovely solo by Maren Montalbano. Joanne Metcalf’s “Shining Light” ended the concert. The choir left one by one, each cradling a branch of greenery for an extroit to the soft sound of the marimba. The hush was delicious, but I could not help but wish that the Crossing might apply their talents to a well-known carol or cantata as well as the new music they introduce to their audiences.